Turkish Sufi shaykh of Central Asia. His life story is shrouded in legend like those of many popular saints. Son of a certain Shaykh Ibrahim, he was born at Sayram (Isfidjab) in Turkistan during the second half of the 11th century. He lost his father at the age of seven and the family settled at Yasi. There he began his education (it is said as a disciple of Arslan Baba), later moving to Bukhara where he became a disciple of the great shaykh Yusuf Hamadhan, and eventually succeeded him in 555/1160. He returned to and remained in Yasi untill his death in 562/1166. "Kizil-bash", ENCYLOPAEDIA OF ISLAM, E. J. Brills First Encyclopaedia of Islam 1913-1936, Edited By Mt Th. Houtsma, A. J. Wensinck, T. W. Arnold, W. Heffening and E. Levi-Provençal, p. 1053-1054. KIZIL-BASH (T. “Red Head”), the name given by the Turks to the confederation of seven Turkoman tribes, Ustadjlu, Shamlu, Tekelü, Baharlu, Dhu’lkadr, Kadjar and Afshar, who placed the shaiks of Ardabil on the throne of Persia and helped Shah Ismail to found the dynasty of the Safawids (q.v.). The latter had given them as a head-dress the red turban worn by the disciples of his ancestors. This name was taken by J. Morier for the title of one of his novels, The Kuzzilbash, a tale of Khurasan, 3 vols., London 1828, the period of which is the reign of Nadir-Shah. The name of a religious sect found throughout Asia Minorand regarded as Shii by the Muslims; it is closely connected with the Nusairis of Syria. Its adepts call themselves Alawi, i.e. followers of Ali. Some are Kurds; the others are for the most part Turks and only speak Turkish. Unlike the Muslims, they do not shave the head and let their beards grow freely; they do not observe the canonical prayers (salat) or ablutions. They drink wine and do not observe Ramadan. They fast for the first twelve days of Muharrem and lament the deaths of al-Hasan abd al-Husain. Ali is an incarnation of God who had already manifested himself in other carnations, such as Jesus. God is one in three persons; below him are five archangels, intermediary between the divinity and man, twelve ministers and forty saints. They have a reverence for the Virgin Mary and recite litanies in her honour. They celebrate a service during the night. The priest who officiates sins prayers in honour of Ali, Jesus, Moses and David, accompanying himself on musical instruments. He holds in his hand a willow wand which he steeps in water; this consecrated water is then distributed among the houses. During the ceremony those precent publicly confess their sins; the priest imposes penances, such as fines in money or kind. The lights are then extinguished (hence the Turkish expression cerag-söndüren, “extinguisher of torches” by which they are popularly known) and they abandon themselves to lamentations and weeping for their sins. The lights are again lit; the priest pronounces the absolution (which may be refused, at least for a certain time); he takes pieses of bread and a cup of wine or similar liquid and after consecrating it steeps the bread in the wine and distributes it among those present. Those whose neighbours cannot report favourably upon them are excluded from it. Among the Kurds a sheep is also sacrified and its flesh is distributed at the same time as the bread and wine. John P. Brown, The Darvishes or Oriental Spiritualism, Ed. By. H. A. Rose, Oxford University Press, London, 1927. p. 187-190. Is the seat of the Shaikh who personifies ‘Ali. Of the cook, called the post of Said Ali Balkhi, one of the caliphs of the Order. Of the breadmaker, called after Bahim (Balim) Sultan. Of the naqib (Deputy Shaikh), named after Gai Gusus (Kaygusuz). Of the maidan. It is occupied by the superintendent of the takia, who represents Sari Ismail. Of the steward of the takia, called after Kuli Achik Hajim Sultan (Kolu Açık Hacım Sultan). Of the coffee-maker, called after Shazili (Şazeli) Sultan. Of the bag-bearer, called after Kara Daulat Jan Baba (Karadonlu Can Baba). Of the sacrificier, called after Ibrahim Khalil-Ullah, or the prophet Abraham of the Old Testament. Of the ordinary attendant of the services, called after Abdal Musa. Of the mihmandar, or the officer charged with attending upon the guests of the takia, called after Khizr (Hızır). Paper presented at Boas/Benedict Graduate Student Conference, Columbia University, New York, 25 March 2000. I am staring at the picture of a dead anthropologist on a warm Sunday afternoon in Şahkulu Sultan cloister in Istanbul. It is the second day of the annual youth festival organized by the Kızılbaş-Alevi youth of this waqf (pious endowment). The dead anthropologist is Carina Thuijs, a Dutch woman who was one of the 37 victims of the Sunni extremist mob who burned a hotel full of mostly left-wing Alevi intellectuals and artists as they were attending an Alevi festival in Sivas, six years ago on a hot July afternoon. Carina’s picture framed in red, stands next to the pictures of other victims on the stage, who have been commemorated as Alevi martyrs for the last six years. A group of youngsters are verbally reenacting the events of that day as they read aloud the slogans of hate hurled at the victims of that bloody festival. Although this performance is very different in form and style than the Shi’i taziya reenactments of the martyrdom of Imam Husayn in Karbela, there is still an uncanny familiarity. The ancestors of these Kızılbaş-Alevi youth have for hundreds of years preserved the tradition of performing mersiye poetry in their cem ceremonies lamenting the ruthless massacre of Imam Husayn and his entourage by the Umayyad caliph Yazid’s forces. What unites these two different reenactments is the theme of death at the hands of tyrants. Semah ritual dance performance during the opening ceremony of the Hacibektas festival. 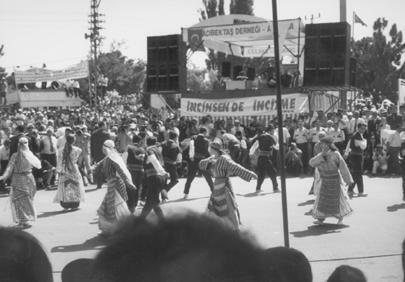 Alevis are a large heterodox Islamic syncretistic minority, consisting of approximately 15 million Turkish and Kurdish-speaking members. Isolated communities with a wide range of local customs were bound together by a segmentary structure until massive migra-tion, beginning the 1950s, brought with it (mainly to the cities of Turkey and Europe) the loss of traditional means of transmitting heritage, the weakening of the socioreligious structure and secularization. Current research and media attention on religious courts, especially Islamic Councils and courts of arbitration, suggest the need for more accurate description and analysis of the diversity of non-state courts that actually exist in today’s multicultural societies. One such forum is the cem ceremony of the Turkish Alevis - which acts as a community based dispute resolution forum. The Alevis are a heterodox, Islamic sect, which make up approximately 15 to 20 percent of the population in Turkey and the same percentage of the Turkish population in European countries. The resolution of disputes at the cem ceremony constitutes a situation of legal pluralism. Some examples from actual cases are used as illustrations to make clear that trust in Dutch state institutions leads to a diminished importance of Alevi religious law. On the other hand, distrust of Alevis in the Turkish institutions leads to the continuation of the situation of legal pluralism in Turkey.